The Champions League final between Liverpool and AC Milan was marred for some fans after they failed to obtain tickets - or even entry - into the game in Athens. Police and fans clashed in ugly scenes outside the ground before the game. BBC Sport looks at the issues surrounding the ticketing arrangements for the game. Q. What was the ticket allocation? Officially, Uefa made 17,000 tickets available to each club for a stadium that had a capacity of 63,000. Q. Why did Liverpool only allocate 11,000 to their fans? Liverpool's explanation was that for every major event like this they have an obligation to their own sponsors, their former players and the like. Any club would use the occasion to award tickets as a thank you to those who work for them, and Liverpool is a club with a strong sense of history and community. It is not unusual, or unreasonable, although fans might question why so many were distributed in this way. Q. 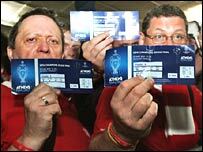 Many of the tickets for the Champions League final are given to the Uefa family. What is meant by this? This is a phrase often coined by the Fifa president Sepp Blatter who likes to refer to the 'football family'. It is a conveniently loose generic definition that covers almost anyone who has anything to do with the game. Uefa might consider that to include all their member associations and federations, clubs, officials, administrators, referees, sponsors, suppliers etc. Q. How were the tickets allocated? It is a bit like a big wedding: You know what the maximum number of guests is, so you start off with the ones you have to invite, then draw up a list of the ones you now want to invite and squeeze as many of them in as possible. Some of the top-line sponsors will know as part of their deal that they will be given a certain allocation for matches. Q. Why were there empty seats? Lots of reasons. Security is one, to allow for proper segregation rows of seats are left unallocated to allow for the stewards, police etc to move between the fans and reduce the risk of trouble. Some seats were lost by the inclusion of advertising stands. When the stadium was in Olympic mode, the capacity was supposed to be 80,000. That dropped to 63,000 for the Champions League final. Q. How did fans without tickets get in? The great, traditional blag. There were by all accounts a pile of forged tickets doing the rounds. High-definition scanners and perforating machines these days make forgeries easy to produce, which is why at the World Cup in Germany last year all tickets had microchips embedded in them that were read at the turnstiles. No chip, no entry was the theory. The Champions League tickets were less sophisticated, but still had holograms, barcodes and watermarks on them: in theory enough to put the forgers off. But in the melee of getting into a football match, that counts for little. Police officers controlling crowds make isolated decisions based on public safety first and foremost. There were no turnstiles in Athens, and when crushes developed at the entry points, fans were waved through with the most cursory of checks. Some said their tickets weren't checked at all. Q. What security measures were in place? Athens police say there were 7,500 officers on duty. They had support from the British and Italian police forces who had spotters monitoring the fans. Around the stadiums, police in riot gear were much in evidence, assisting the stewards with ticket checks and in ushering the crowds in through the 'funnels' they created with lines of police vans etc. There was CCTV covering the main access points. 7,500 officers is a lot. Far more, for example, than the number on duty for the FA Cup final last week. So that should have been enough. What went fundamentally wrong is the system in place for ticket checks just was not effective. As soon as that broke down, the problems began. Stewards inside the stadium could not or would not do much about the problem of fans with forgeries sitting in the seats of genuinely ticketed fans, who in turn took someone else's seat. In the end the gangways and access areas filled up with displaced fans, so Uefa took the decision to close the stadium, leaving fans with genuine tickets locked out - and understandably furious. Q. What about the suitability of the stadium? It is a cracking stadium for athletics, big enough for major football matches, albeit with the drawback of the running track between the fans and the action. The transport system coped well with large numbers of spectators at the Olympics and Athens is a lively, bustling city well used to holding major events, with an experienced police force, so no real issues there. Q. Did police react in the right way? Probably. No-one seems to have been seriously hurt, and that's their main objective. That is not to say it could not have been handled better, for the reasons above. As soon as the ticket checking process started to fail, the outcome was inevitable. Q. Are the fans culpable? Any fair analysis will have to conclude some responsibility rests with the fans who knowingly bought forged tickets, and ticket-less fans who tried to rush gates, or just create an incident, knowing in the end, as happens every time, not everyone's ticket will be checked. It is dishonest and they're cheating their own mates. Q. Who is ultimately responsible? It is Uefa's competition. It decides where the finals are played, co-ordinates the ticketing arrangements and liaises with the hosts over how to make the game work at all levels. It is Uefa's property to protect and it has been asked to provide answers for why things went wrong. Uefa says it was the behaviour of the Liverpool fans that exacerbated the problem, but of course the reality is there were a combination of factors responsible.